When setting up a new cluster, there are several network-related tasks that you might need to perform. Make sure that your client network’s DNS system is configured as described in Configuring DNS for the Avere Cluster, below. Client access is controlled by the cluster’s virtual servers (vservers). VServer setup is described in detail in Configuring VServers and Global Namespace. If you need to provide additional IP addresses for cluster nodes, use the Cluster Networks settings page. Read Cluster > Cluster Networks in the Cluster Configuration Guide for details. If your network hosts use Active Directory or another kind of external directory service, you must modify the cluster’s directory services configuration to set up how the cluster downloads username and group information. Read Cluster > Directory Services in the Cluster Configuration Guide for details. Note that the Avere cluster requires an AD server to support SMB. Configure AD before starting to set up SMB. You should configure any additional VLANs needed before defining your cluster’s vservers and global namespace. Read Configuring VServers and Global Namespace and Working with VLANs in the Cluster Configuration Guide to learn more. If your cluster is required to use a proxy server to access external addresses, define it in the Proxy Configuration settings page and apply it by using the Cluster > General Setup page or the Core Filer Details page. Read Cluster > Proxy Configuration in the Cluster Configuration Guide for details. Read Encryption Certificates for details about how to store security certificates for use by the cluster. For additional information about network services used by the Avere cluster, read Configuring Network Services for an Avere Cluster in the Cluster Configuration Guide. This section explains the basics for setting up DNS for your Avere OS cluster. If your system is accessed by NFS clients only, using DNS is recommended but not required; it is possible to specify all network addresses by using numeric IP addresses. If your system supports SMB (CIFS) access, DNS is required, because you must specify a DNS domain for the Active Directory server. DNS also is required if you want to use Kerberos authentication. When clients access the cluster, RRDNS automatically balances their requests among all available interfaces. For optimal performance, configure your DNS server to handle client-facing cluster addresses as shown in the following diagram. A cluster vserver is shown on the left, and IP addresses appear in the center and on the right. 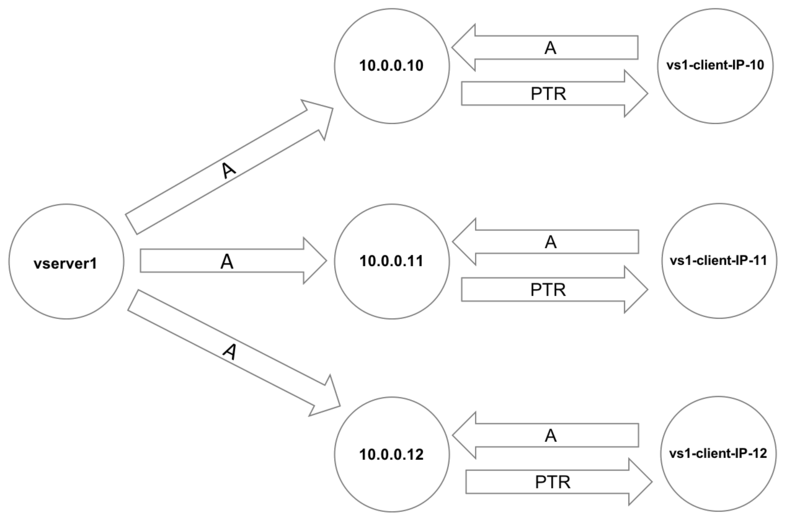 Configure each client access point with A records and pointers as illustrated. Clients mount the cluster using the vserver name as the server argument. Read DNS Settings in the Cluster Configuration Guide for more details about using this page. If you need to upload certificates to the cluster, use the Cluster > Certificates settings page. Read Cluster > Certificates in the Cluster Configuration Guide for details. To encrypt cluster management communication, use the Cluster > General Setup settings page to select which certificate to use for administrative SSL. Cloud service access keys are stored by using the Cloud Credentials configuration page. Read Cloud Credentials for an overview of that process.